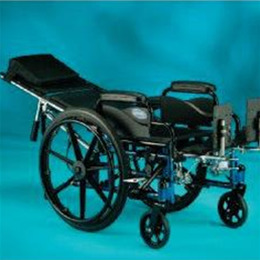 The 9000 Jymni is available with a Recliner frame that transforms the chair into a full reclining wheelchair. •Dynamic recline from 95° to 160°. •Durable, carbon steel frame is longlasting. •Stroller handles provide ergonomic positioning for caregiver and remove for ease in transporting. •Adjustable front riggings provide ideal positioning for pediatric user. •Flame-retardant upholstery resists mildew and bacteria, as well as cold-crack and UV damage.